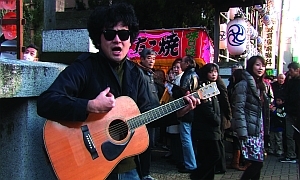 Tetsuaki MATSUE’s documentary film is set on New Years Day 2009 and portrays singer/songwriter Kenta MAENO. In a single 74 minute shot, MATSUE accompanies the musician on his pilgrimage from Kichijoji Hachiman shrine to Inokashira park, where he performs a song with his band. After the screening, MAENO will give a live concert at the festival center.